Diverse Energy Systems, and its subsidiary ITS Engineered Systems (collectively “Diverse or the “Company”), manufacture new oil and gas field service equipment to be sold on a single unit basis or as a group. Diverse also manufactures certain types of equipment, primarily artificial lift, power generation and vapor recovery units, to be used in its rental fleet. All equipment is configured to appropriately accommodate the characteristics of the specific application it will service. Additionally, Diverse offers support and maintenance service to its customers for both leased and owned equipment. In order to build an infrastructure capable of supporting substantial continued revenue growth, the Company made significant investments in SG&A and facilities in 2012, 2013 and 2014. As Diverse was poised to take advantage of an increase in revenue related to the boom in U.S. fracking, the industry slowed as the price of oil plummeted, leaving the Company with an inflated cost structure and under-utilized manufacturing capacity for the current revenue level. As a result, Diverse was forced to complete difficult but necessary cost savings initiatives to right-size the business. Despite the Company’s cost saving efforts, the continued decline in performance through Q3 2015 placed additional strain on the Company’s lack of liquidity. In September 2015, in order to avoid further deterioration of its business and to retain the value of its assets, Diverse filed for protection under Chapter 11 bankruptcy. ITS Engineered Systems, had already filed for protection under Chapter 11 bankruptcy in April 2015. SSG and Chiron Financial Group, Inc. (“Chiron”) were retained by Diverse in May 2015 to evaluate strategic alternatives. In addition to contacting a number of potential lenders to attempt to refinance the debt, SSG and Chiron also conducted a comprehensive marketing process to strategic and financial buyers to determine if there was an interest in creating a partnership. While multiple parties engaged in a thorough review of the business and submitted offers, Diverse and its advisors concluded that the best option was to proceed with a sale effectuated through a Chapter 11 Section 363 process in the U.S. Bankruptcy Court for the Southern District of Texas to structure the optimal solution for the Company. Several parties engaged in a thorough review of the business. 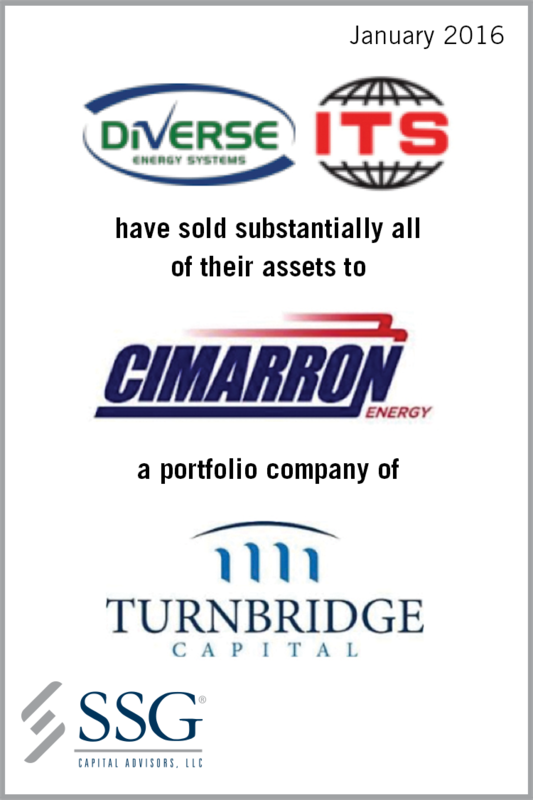 The offer from Cimmaron Energy, Inc., a portfolio company of Turnbridge Capital, LLC, was determined to be the highest and best offer. The transaction closed in January 2016.